Blame It On The Jersey? I used to not be superstitious about anything, much less sports. But my husband has convinced me that being superstitious about your favorite sports teams might make sense. Case in point: Yesterday, the Flyers were visiting their division rival Washington Capitals in a Sunday afternoon game that was nationally televised. Before leaving for lunch with a friend, I set up the DVR to record the game. When I got home I checked the score on my phone and the Flyers were losing 4-2. I was afraid to turn on the televised game for fear of jinxing the Flyers, but I kept an eye on the score via the internet. To my pleasant surprise, the Flyers tied the game with two goals late in the third period, then went on to win in overtime on a goal by Vinny Lecavalier – giving him his 900th NHL point. Quite the thrilling comeback indeed! After the game ended I was excited to go back and watch the highlights on the DVR. However, when I checked the recordings, the game was not there. I immediately knew what had happened: my superstitious husband had erased it. When I asked him about it he defended his actions saying: “Well, if I wouldn’t have stopped it, they probably would have lost 10-3.” I wanted to be angry at him, but I couldn’t. Because, I have learned that there may be something to this superstition thing. In my husband’s case, there is no watching, recording, or checking in on Flyers games. Because, when you do, something bad is bound to happen. I also believe that superstition plays a role at games one attends. 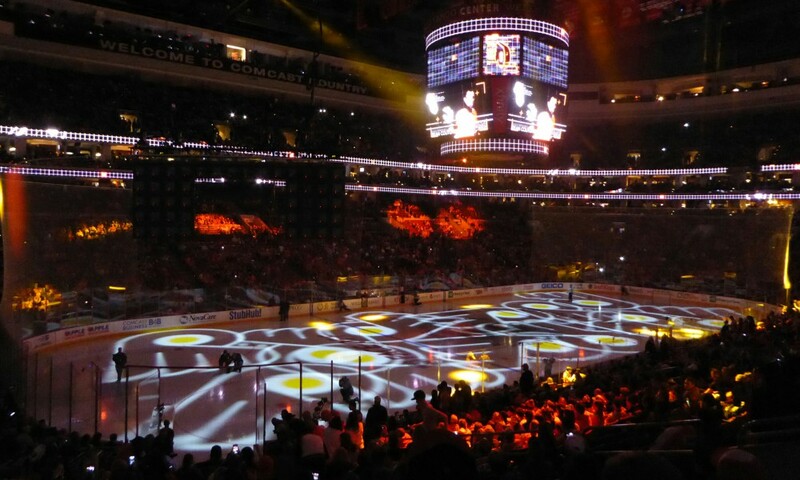 My husband and I like to stick to a routine when going to Flyers games: arrive at Wells Fargo Center before the doors open, eat a cheese steak sandwich, and then head to our seats well before warm-ups start. I have also decided that what I wear matters. I usually wear my Chris Pronger jersey – my first (and favorite) hockey jersey. However, when going to a recent game I decided to wear a Claude Giroux Winter Classic jersey. The jersey is essentially mine by default. Several years ago I ordered it for my husband for Christmas, thinking it would be the ultimate cool gift and a total surprise. To my dismay (and surprise), the same day the jersey I ordered arrived, another Giroux Winter Classic jersey arrived, having been ordered by my husband for himself. So, this particular Flyers game, I decided to wear “my” Giroux jersey. Well, the Flyers lost the game and I vowed to never wear that jersey to a game again, even though I am a huge Giroux fan. The next game, I wore my Pronger jersey and the Flyers won. I know that I am not the only person who is superstitious about his or her favorite sports team. I have heard other fans discuss this, and there is a popular beer commercial that explores fans’ good luck rituals, saying: “It’s only weird if it doesn’t work.” And, it is well publicized that many athletes are superstitious, especially when it comes to their game-day rituals. But I say, if the Flyers lose when I am there, should I blame it on the jersey?